My husband Tom and two sons, Tom (age 22) and Tim (age 19) and I love to travel and see new things. We have traveled to all of the U.S. states except Calif in a motor home and have seen many things. We then began to explore the Caribbean (St. Lucia which we really loved, Tortola which was great (Long Bay Beach particularly), the Bahamas, etc. We love boats and the outdoors (fishing, camping, snow and water skiing, hiking, and especially boating). We had a 20foot Sea Ray since 1976 and would trailer it to nearby lakes to ski and boat. After 30 years, we finally made the decision (which we had been discussing forever) to buy a boat and dock it on Lake Erie near the Islands in western Ohio. We bought a 45 foot Silverton at a great price three years ago and we love it and going up there every weekend to boat. We like to go to the islands (put-in-bay, kelley's), and cruise to new places (which we haven't done too much of yet). We have had the boat for three years (this is the third season) and haven't been able to come up with a name that we all like. Any ideas? Boat names and comments below please... By the way, BoatNameGear has the ability to do custom embroidery on shirts, sweats and jackets with the Silverton logo. Inquire at BoatNameGear.com. 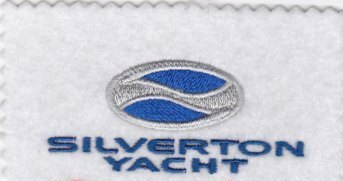 Also, while we're on the subject, please check out our friends at SilvertonForums.com, a free forum for Silverton owners.